I like flavored seltzer water. There's no sugar in the stuff, just flavor and carbonated water. I'll even drink tonic water or plain seltzer, but give me the fruit flavor to replace soda. I've cut way down on my consumption of my beloved Dr Pepper thanks to this although flavored seltzer is, even on sale, 2-3 times what soda is. Makes you wonder, doesn't it? So, the last grocery trip, I bought another 12 pack. I was emptying the car and I picked up the carton by that silly indentation they have on the top of the pack. There was a malfunction. We'd received a quarter inch of snow and we'd had some melting at the end of February. They all landed in icy cold muddy water in the drive. Yes, for a moment, I entertained leaving them there. After all, it was cold out. 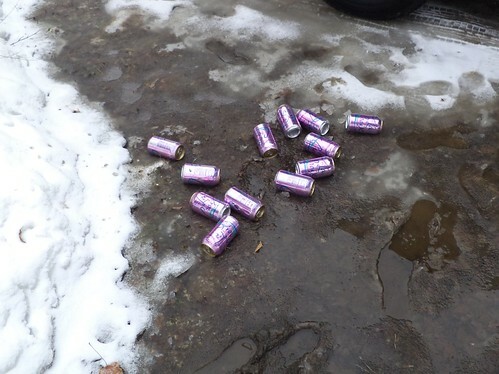 But it was to get below freezing and then I'd have exploding cans on my hands. I brought them inside and washed off the cans, sticking them in the nearly empty box of the previous 12 pack. Guess I need to check the structural integrity of the cartons now.